Dill (Anethum graveolens), is a popular culinary herb which has been used medicinally since ancient Egyptian, Greek, and Roman times. It is an annual herb in the celery family Apiaceae, and is the only species in the genus Anethum. This herb often grows up to 40 – 60cm and has slender, hollow stems, and alternate, finely divided, feathery leaves which are similar to those of fennel, except harder in texture. The flowers are commonly white to yellow in colour and the aroma is similar to that of aniseed. 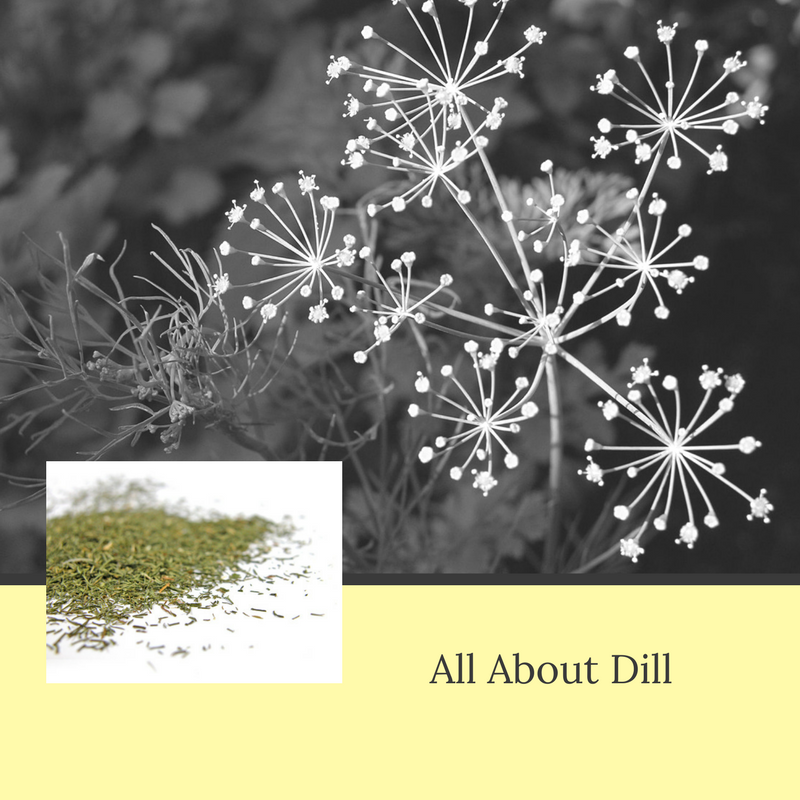 Dill originated in the Mediterranean region, specifically southern Russia, and West Africa. The parts of this plant commonly used are the leaves, flowers, and seeds. The leaves should be picked fresh, usually after the plant has reached 8.5cm in height, as the leaves are often difficult to dry successfully. The dried leaves need to be stored in an airtight container so as to retain some of their flavour. The seeds should be collected when fully mature and then spread out and air dried. Essential oils can be extracted from the fresh leaves and the seeds, with these two oils differing slightly in scent and taste. The name ‘dill’ comes from the Saxon word ‘dilla’ which means to ‘lull’ or ‘soothe’. When taken internally, this herb is used to relieve an upset stomach, bloating, gas, and nausea. Dill leaves can be added to food, even in large amounts, as it is not too overpowering. It goes well with fish, particularly salmon, as well as in butters, sour cream, in egg dishes, or with potatoes. Dill seeds can be used whole or crushed. The crushed seeds can also be added to boiling water to make tea. Add 2 teaspoons of crushed seeds to 250mL of boiling water and steep for 5 minutes. To make dill water, add 2 pinches of dill seeds to 250mL of water and bring to the boil. After the colour changes, continue boiling for another minute and then strain and cool. When applied to the skin, dill can sometimes cause skin irritation. Dill juice can also cause the skin to become sensitive to sunlight. In small amounts, dill is considered safe for pregnant and breastfeeding women. However, excess or supplementary forms of dill may induce menstruation which may cause miscarriage. People who are allergic to plants in the carrot family (asafoetida, celery, caraway, fennel, and coriander) are likely to be allergic to this herb. Dill extract may lower blood sugar in people with diabetes, causing hypoglycaemia. 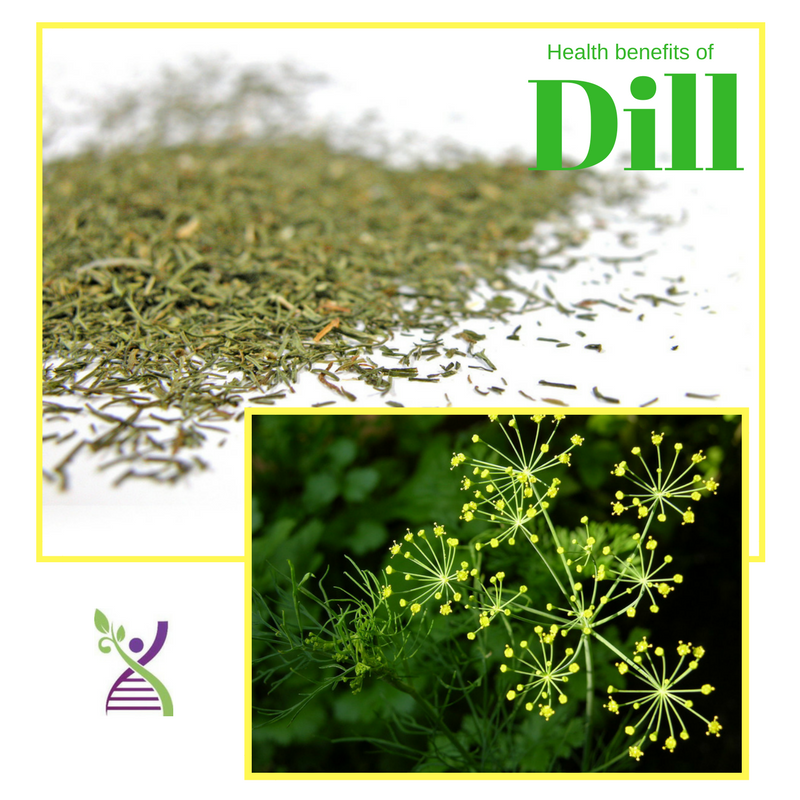 You should always consult a doctor or physician before taking dill supplements as it may cause adverse side effect,s or interact with other medications. Essential oils are usually highly concentrated and so not always safe to ingest, particularly without first being diluted.